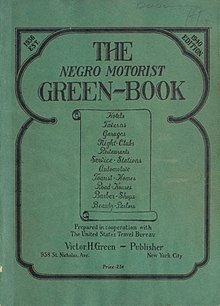 I asked my father who is 86 years old, born in Kansas and traveled to the south for the first time in 1961 about it and he said he had heard of some sort of document that detailed where blacks could eat and stay but did not know what it was called nor did he ever obtain a copy of it even though he asked around. He added that in October of 1961 he was flown by Chrysler from Wichita, Kansas to Huntsville, Alabama to interview for a position as an electronic engineer. His prospective employers did not know of any accommodations that were integrated, so they reached out to a dean at the local HBCU, Alabama A&M, who connected him with a women who let him stay in her home during the interview process. He recalls that this was the first time she had rented a space and after 3 or 4 days upon departure asked how much he owed her and she said 8 or 9 dollars. He recalls talking her into a higher amount so that he could put in a reasonable claim on his expense report. One month later he accepted the job offer and we moved from Kansas to Alabama. My dad remembered when Martin Luther King Jr. came to visit and organize in Huntsville in 1963 that King stayed with a local family again because the hotel accommodations were all segregated. And finally my dad recalled when were driving through Memphis in the 60s and we were told of a hotel we could stay in and it was not the Lorraine.